Here’s a great review of these two cameras. 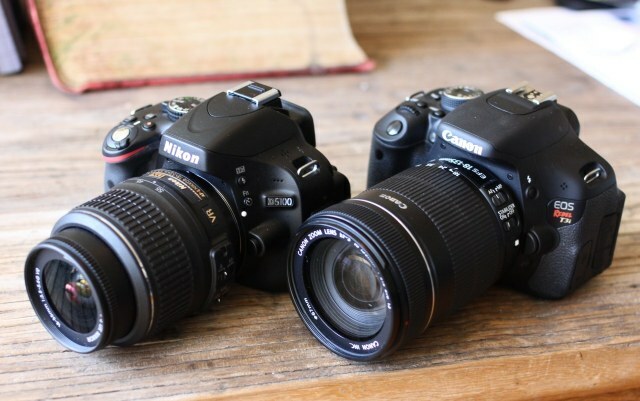 Head-To-Head Review: Canon T3i Vs. Nikon D5100 | TechCrunch. I’ve loved both Nikon and Canon for different reasons. These two cameras are closely enough matched so that you can make the choice based on your existing lenses or because you’re more familiar with one or the other. These are both great cameras, especially for the price. I nearly bought the D5100 but then realised it didn’t have an auto focus motor so ‘had to’ plump for the D7000 which is a lovely bit of kit, though I would have liked the tilt and swivel screen of the D5100. Previous post: FCP7 vs FCPX – Deathmatch!